Adam himself has been working with these makers to showcase their skills to an international audience outside of Japan, with the help of editor and co-worker Tom Slemmons. Their main outlet is the re:new tohoku website that offers a look at different craftsman and their works, also showcasing their skills in video form, like what you see below. In fact they even brought this government run project across to London in summer last year where they held an exhibition at Asia House, a lot of the objects were presented here in the UK for the first time. Quite exciting to say the least. The re:new tohoku videos were produced with the help of a talented team from the US led by Jason Walsh, you can get a taste of those in our previous post on Yukinori Jinnohara. Moving back to the videos, you could probably spend a long while viewing them all on his Vimeo page, so I’d recommend putting some spare time away this week if you can. You could even check out the different video categories on the re:new tohoku website linked below under the ‘Videos’ section. The four I pulled up include a “kiji-shi” (wooden artist) who’s making wooden bowls on the lathe, these will then have urushi applied to them at a later date. Another one was a Fukui artisan who applies urushi to the stem of a wineglass, quite contemporary and isn’t something I’ve ever seen before. 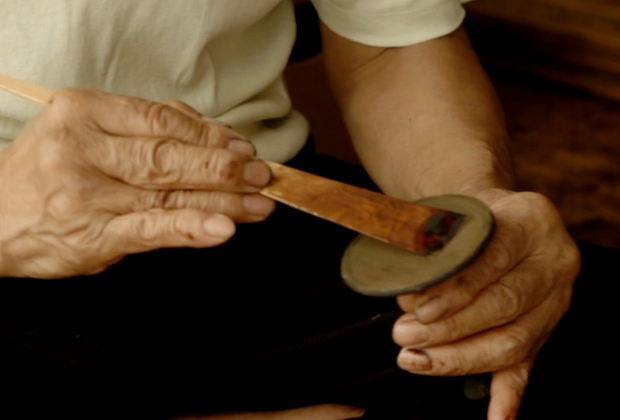 It’s great to see this specific craftsman working in silence and using a steady hand to apply the lacquer, saying that two artists who do need a very steady hand are those that practice the art of Kintsugi. The Japanese art of fixing broken pottery with a lacquer resin sprinkled with powdered gold. Hopefully I’ll be able to delve into that subject in more detail another day, for now watch on below and follow the links for other interesting short films like these.